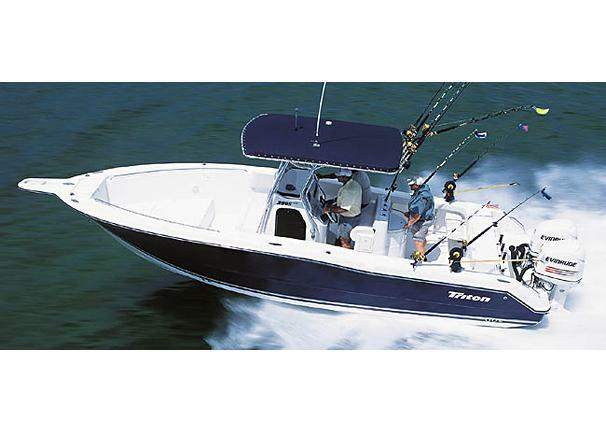 Boat Description This big, beamy, blue water minded twenty-eight footer has it all  from a wave taming, spray shedding deep-vee hull, to a high output circular baitwell that keeps baitfish alive and kickin in an oxygen charged environment. Every square inch of this wood-free offshore battlewagon has been designed to maximize comfort, storage and fishability. Why there is more available fishing area and more room to stow rods, reels, tackle and accessories on this rig than a lot of boats over thirty feet. So whether youre plugging off the beach, trolling a six bait spread, live lining or chunking, the Triton 2895 Center Console has what it takes to take care of business.